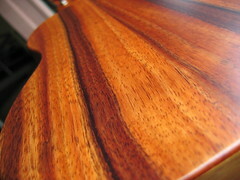 There are different varieties of finishes for ukuleles, these include gloss, satin and varnish. Ukuleles with satin finish have a matte and soft appearance, making them very appealing for customers who have a taste for natural-looking instruments. In this setting, nitrocellulose lacquer finish is used. Since the satin finish is more convenient to administer, the costs are usually lower for it, making them more affordable. Classic ukuleles usually have this type of finish, and this is due to the fact that the new high-gloss automotive-type finishes haven’t been invented in that time. The newer gloss finish have very elegant, bright and mirror glow which highly accentuates the color and grain patterns of the wood. They are also very durable. Since there more work done in this type of finish (this includes the application and buffing of the gloss finish), this type is more expensive when compared to satin finishes. Nowadays, more and more people are making the switch to this kind of finish. Ukuleles with lacquer finishes typically gives them superb tone and volume. The varnish type of finish, which is also known as the “French Polish”, is the most traditional of all finishes – making use of natural resins which are combined with spirit solvents. The concoction used is then applied manually and polished thoroughly in order to give the ukulele a very thin and protective finish. The varnish finish is an excellent way of retaining the acoustic properties of the ukulele, allowing the wood to vibrate freely too. This type of finish does not really look perfect at all, but better looking varnishes can commonly be found on acoustic guitars and violins. The French polish finish is essentially done by dissolving resin in alcohol, which is then administered in the wood with the use of a small cloth pad. Despite the name, this type of finish is not considered the same as furniture polish, but more of a lacquer finish. This type of finish is also very labor-intensive and the process may take a long time because of the work being 100% manual. Because of this, the varnish finish is the most expensive of all ukulele finishes. For me, these three types of ukulele finishes does not make much of a difference at all – try playing these 3 types in a dark room, you hardly won’t notice any difference in the sound produced. To make things simpler, it is best that you base your decision on the sound quality of the ukulele you are about to buy, and not on the finish. One important thing to remember is that whatever you ukulele’s finish is, they all require proper care and maintenance. Refrain from using rough picks, and make sure you don’t scratch the body of your ukulele with your fingernails. Always keep a clean polishing cloth with you to keep your ukulele shiny. This entry was posted on Monday, January 11th, 2010 at 9:38 pm and is filed under ukulele . You can follow any responses to this entry through the RSS 2.0 feed. Both comments and pings are currently closed.